Brooklands is a grade 2 listed, detached Georgian house situated in the medieval ‘Southover’ part of historic Lewes. 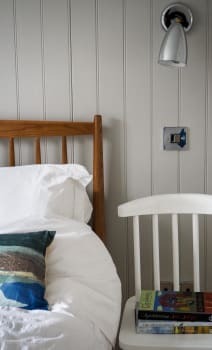 Guests are warmly welcomed; we want them to feel truly relaxed and at home. The house is stylishly furnished and has comfortable king sized beds. There is a minimum 2 night stay at the weekend in season. 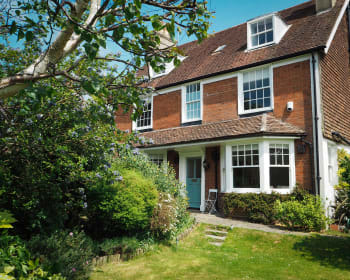 The house is ideally situated for walking to the key sites of Lewes as well as being a short walk from open countryside and the South Downs Way. Brighton and a stunning coastline are a short train or car journey away. 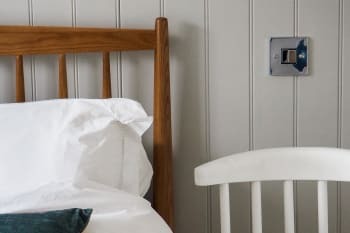 Brooklands offers two luxury rooms for bed and breakfast. There are no rooms available at Brooklands Lewes for these dates. Friendly welcome, amd good local advice. Lovely B and B which was very comfortable and which provided all the facilities that were required. Very good breakfast. Ideally located. we hope to return and will certainly recommend it to friends. The room was very comfortable, bathroom excellent. breakfast plentiful and tasty. Welcoming host, only one minor point - in that the bed wasnt made for our scond day!! Not a deal breaker, but would have made the stay absolutely perfect. 10/15 minute walk into Town, so no parking problems. Antiques galore, shoppers delight. Local Inn, 2 mins away, served good pub meals, so no need to take car. Great local real ale. Mioya is an excellent host. We were warmly welcomed and well looked after during our week's stay. The room and en suite were large and spotlessly clean and the breakfasts tasty and plentiful. The short walk in to Lewes was pleasant and easy, if you can avoid the steep climb by walking round the long way via the station! Anne os Cleves House is a must if you are interested in history, as is the Priory. We did not manage to do the Castle - that's for the next visit. VBrighton and Eastborne are easily accessible by bus and train for a day by the sea. The Swan Inn serves good meals and the atmosphere there is friendly and welcoming. lovely cooked home made breakfast. short walk into town to visit all the historical sites and antique shops. Brilliant communications prior to arrival. Excellent accommodation and breakfast. Very friendly and welcoming. Traffic noise from road could be intrusive but we slept well. The Swan pub 200 yards away provides very tasty reasonably priced food and very well kept beers. Lewes centre is within easy walking distance. We visited the Seven Sisters on the coast and walked four of them! Easy access to South Downs for sight seeing and walking. Great, easy access to South Downs and Brighton. We enjoyed our stay in Brookland Lewes so much. Moya is a very kind and helpful host.Breakfast was fantastic and interior design very stylish, bathroom is amazing. Everything is perfectly clean. House is located nearby a street ( that is why rated only 4) but therefore all the attractions are nearby and comfortable to be visited by walking. Whenever we will travel to that Region we will come again! Thank you so much Moya for a wonderful stay!! We had a lovely comfortable stay at Brooklands. It was so nice to be near the centre of Lewes and yet it was quiet and peaceful. Home away from home, excellent breakfast, warm host. A beautiful home to base yourself. 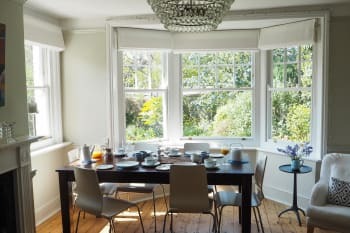 Great breakfast, beautiful room.Cannot recommend enough. host provides lots of helpful info and tips. The Swan Inn (2 mins walk) great food and great Pub. Great breakfast, wonderful shower. Pleasant place to stay while in Lewes. We would definitely recomend Brooklands. We were made very welcome. Room very comfortable. Bathroom huge and extremely well equipped. Breakfast first class. A very enjoyable stay in a stylish and attractive house. The Grange just off Southover High Street is a must visit - beautiful gardens. Bill's in Cliffe excellent for food. The Swan pub just round the corner is a great place for a hearty meal - friendly service and a buzzy vibe and they play their eclectic mix of vinyl with the cover propped up on the bar so you can identify any favourites. We’d recommend doing the guided tour of Charleston - and pop over to Berwick Church - to get a real insight into the Bloomsbury group. Great place to stay, friendly and helpful host. My husband and I ran the Brighton Marathon on Sunday and Moya kindly made us an early breakfast (porridge at 7am) which was much appreciated. Some of our favourites. The Swann Inn which is a really nice pub , 30 seconds away from the house.Great food and beers. They play vinyl albums at the bar, always a good sign. The Ann of Cleves House Museum is very close to the house also. The Castle is great, you get a great view of Lewes and the surrounding area. Walks on the South Downs - While slightly muddy when we stayed , the area is beautiful and definitely should be explored. We had an excellent stay. The accommodation was superb - spotless, comfortable and very stylish, with a bathroom to die for. Breakfasts were also excellent. Moyà was very friendly and sent us information about restaurants, etc prior to our visit. We would definitely recommend Brooklands and look forward to visiting again. The house is ideally situated for walks on the South Downs, pleasant drives to the coast or an easy walk to the shops and railway station. Moya is an excellent host both warm & welcoming. Her breakfasts are excellent , both the cooked & continental. 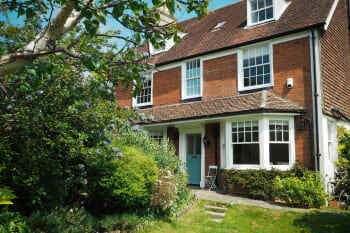 Staying at Brooklands was a most enjoyable way to spend my first days of living in Lewes. Fantastic breakfasts served and very comfortable bed and bathroom facilities. Useful information provided by Moya. Visit The Depot for the cinema and a drink/dinner after - great atmosphere. The Flint Owl Bakery is a good place for a coffee and bun but it gets busy. Le Magasin in the Cliff area is a great place for lunch/dinner. Easy to park at the station and catch the train to Brighton (11 min). Warm and friendly welcome from host Moya, fantastic breakfast. Great location to explore centre of Lewes and also walking routes. Spotlessly clean throughout, shower was great and a lovely big bath too. The room felt spacious, plenty of storage and included a very informative guide by the hosts. Will definitely be recommending to friends and family. Anne of Cleves house and castle for history fix. Lots of great local shops. Particularly liked Flint Owl bakery for tea and cake stop. A really lovely place to stay - we wished we could have stayed another night and done some walks. Elegant residence,well kept to a high standard,extremely comfortable and very clean. Delighted with our room and the ensuite bathroom. Breakfast was beautifully presented and well cooked,very satisfying. Our hosts were welcoming,friendly and kind and we thoroughly enjoyed our stay. Can't wait to return. Highly recommended. Try to do some of the local walks,scenery is beautiful and people are warm and friendly. The Swan is very handy, almost just across the road. Even with good directions, the house was difficult to find whilst driving, it is on a main road as you would expect with a house of this age. Excellent local pub. Lewes is a charming town, surrounding area is lovely. Thankyou for your kind review. Looking forward to seeing you again soon. Loved this place - were warmly welcomed on arrival. The room was spotless,very comfortable with an enormous bathroom and luxury roll top bath.Hosts have tips for exploring the area, and local walks. 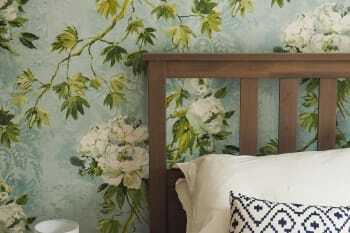 Great for Glyndebourne, and places to visit. The local pub, the Swan, is a really friendly place with good food. Walks can be taken from house to the South Downs within minutes.